"Trixie, this is Nick Roberts," the solemn voice said. "I just wanted you to know that my father is home. Sergeant Molinson released him without pressing charges - although he made it clear that Dad really isn't off the hook yet." "Oh Nick, I'm so glad. About your father's being released, not about his not being off the hook," Trixie told him. "I bet he's glad to be home." "Well," Nick said slowly, "actually, he doesn't seem glad about much of anything. He's really acting as if it's all over - as if he'll never be able to get his life back together again." "Oh, Nick, that isn't true," Trixie protested. "I know this whole thing is awful, but it can't last forever." "I know that," Nick said. "I told Dad we should just keep moving ahead. The insurance company is holding off on paying our claim, of course. But we have lots of inventory in the basement of our house - I told you the store was too small to hold everything. It's all paid for, and we have enough in savings to buy new equipment. We could rent a new store or work out of the house." Nick's voice had gathered enthusiasm as he spoke. The enthusiasm left suddenly, though, as he added, "Dad won't even talk about the idea. He just doesn't seem to have the energy to start over." There was a long silence. Trixie couldn't think of any way to respond. "Well," Nick said, "I shouldn't be bothering you with all of this. I really only called to tell you that Dad is home, and to thank you for your help this morning." "Oh, Nick, you mustn't think you were bothering me," Trixie said emphatically, realising that her silence had been misinterpreted. "I'm bothering me, because I can't think of anything to do about all this. But I'd feel even worse if I thought you were avoiding talking to me about it." "I really believe you mean that," Nick said. "I do!" Trixie told him. "That means a lot, Trixie, it really does." Nick's voice suddenly sounded choked. "I'll keep you posted. Good-bye." Trixie felt tears welling up in her eyes as she hung up the phone. Nick was so grateful for simple friendship, but it was going to take more than friendship to get his family back on track. 10. Was It a Payoff? 11. "We're Going to the Police!" 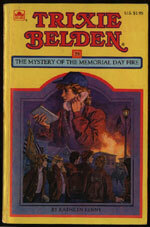 The Bob-Whites are looking forward to a memorable Memorial Day Parade, but what they don't expect is the explosion that shatters the excitement and threatens to ruin the life of one of their school friends, Nick Roberts. Nick's father's store is ruined in the explosion and his father becomes the prime suspect of arson. Trixie is determined to find the arsonist and her suspicion turns to Jane Dix-Strauss, a journalist Trixie has taken an immediate dislike to. When the Bob-Whites attempts to help Mr Roberts and earn some money to repair the clubhouse are thwarted by another fire and the finger is again pointed at Mr Roberts, Trixie accuses Dix-Strauss of arson and starts a chain of events that will reveal the true arsonist and clear Mr Roberts' name. Mr Slettom - he set both fires and attempted to frame Mr Roberts' and kill Jane Dix-Strauss when Trixie made her a reasonable suspect. His secretary was an accomplice. The story commences on Memorial Day in early June. The Bob-Whites see Nick and re-tell the story of The Mystery Off Old Telegraph Road which was the author's first Trixie Belden book. Nicholas Roberts, Nick's father, is described as 'a dark, heavy-set man' (p. 17). 'Dan Mangan, too, had once been at the mercy of a mean stepfather' (p. 11). Since when did Dan have a stepfather? The Beldens drive a maroon sedan (p. 31). The explosion occurs on West Second Street and the location of the Roberts' store is 431 West Second Street (p. 36-37). It was the first week of June (p. 75) which means Mart should have celebrated his birthday after Memorial Day (the last Monday in May) on June 1, but this is not mentioned. Mart has his junior driver's license (p. 112) but he is not permitted to drive without an adult. The stables are on fire and the horses were fretting, but there is no sign of Regan! Where is he?